Children have a delightful talent for torturing adults with big questions. Often it's as simple as using that one word inquiry of "Why?" There are plenty of others, such as why is the sky blue? What makes snow? How do birds fly? How does a boat float, but a rock sink? A gifted child asks difficult questions. When you have a gifted child, the questions can sometimes get quite daunting. I remember my wife Jo Ann commenting that by the time our daughter Alexa was in first grade her questions were complicated. I recall one in particular: the ball in the wagon conundrum. As so many small children do, Alexa had a little red wagon. Also as so many children, she liked to carry things around in it. One item in particular was her favorite: one of her big bouncy balls. She pulled that wagon all over the neighborhood and enjoyed tossing and kicking that ball around with her friends. Then one day she came to me with the question. "Daddy, tell me why the ball go backwards when I pull the wagon forward?" I'd actually seen a scientist on the television show, Nova, talk about how he asked the same question of his dad and how his dad answered it. Taking her by the hand, I led her outside. I told her to stand next to the wagon and watch as I pulled it. Placing the ball right up at the front of the wagon, I cast a quick glance to the side to insure she was paying attention. I grabbed the handle and gave it a hard tug. Just as she’d said, the ball moved towards the back of the wagon. This is how it appeared to me. I turned to Alexa. The look of shock and awe told me she’d seen what she needed to see. I opened my mouth to ask her about it. I never got the chance. “Daddy, daddy, the ball stayed in the same place,” she blurted out. She, of course, simply had to know why it had done that. Given her age, I decided not to launch into a long dissertation on Sir Isaac Newton and his Three Laws of Motion. I felt a simplified version was best. As for Alexa, she’d learned a basic concept of the physical world. 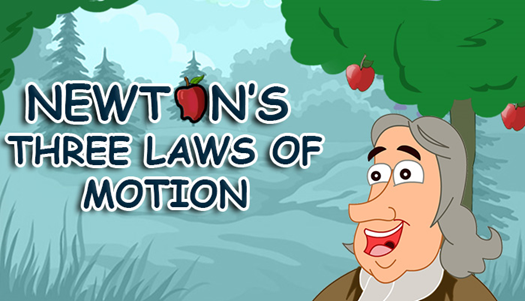 Others would follow, most taught to her by her teachers, but I was the one to explain Newton’s First Law of Motion. Granted, she wouldn’t know its name until later, but it meant a lot to me to be able to impart that little piece of science in her mind. I find it rather appropriate that I should be the one to teach her his First Law. It also makes me happy to see that she’s never stopped learning. May her thirst, for knowledge, never go unsatisfied?